September 24, 2009: NASA scientists have discovered water molecules in the polar regions of the Moon. Instruments aboard three separate spacecraft revealed water molecules in amounts that are greater than predicted, but still relatively small. Hydroxyl, a molecule consisting of one oxygen atom and one hydrogen atom, also was found in the lunar soil. The findings were published in Thursday's edition of the journal Science. 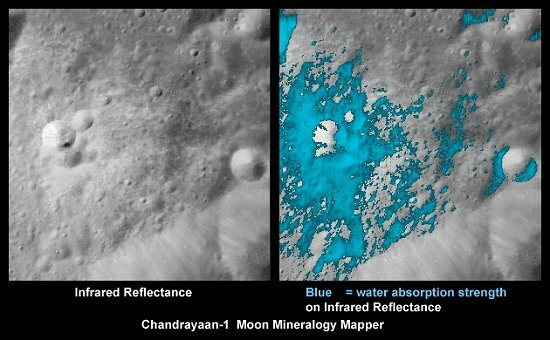 The observations were made by NASA's Moon Mineralogy Mapper, or M3 ("M-cubed"), aboard the Indian Space Research Organization's Chandrayaan-1 spacecraft. NASA's Cassini spacecraft and NASA's Epoxi spacecraft have confirmed the find. "Water ice on the Moon has been something of a holy grail for lunar scientists for a very long time," said Jim Green, director of the Planetary Science Division at NASA Headquarters in Washington. "This surprising finding has come about through the ingenuity, perseverance and international cooperation between NASA and the India Space Research Organization." From its perch in lunar orbit, M3's state-of-the-art spectrometer measured light reflecting off the Moon's surface at infrared wavelengths, splitting the spectral colors of the lunar surface into small enough bits to reveal a new level of detail in surface composition. When the M3 science team analyzed data from the instrument, they found the wavelengths of light being absorbed were consistent with the absorption patterns for water molecules and hydroxyl. When we say 'water on the Moon,' we are not talking about lakes, oceans or even puddles," explained Carle Pieters, M3's principal investigator from Brown University, Providence, R.I. "Water on the Moon means molecules of water and hydroxyl that interact with molecules of rock and dust specifically in the top millimeters of the Moon's surface. 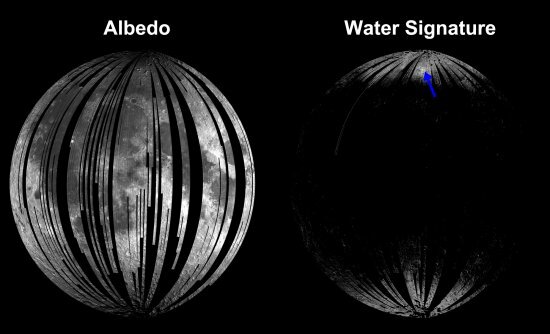 The M3 team found water molecules and hydroxyl at diverse areas of the sunlit region of the Moon's surface, but the water signature appeared stronger at the Moon's higher latitudes. Water molecules and hydroxyl previously were suspected in data from a Cassini flyby of the Moon in 1999, but the findings were not published until now. "The data from Cassini's VIMS instrument and M3 closely agree," said Roger Clark, a U.S. Geological Survey scientist in Denver and member of both the VIMS and M3 teams. "We see both water and hydroxyl. While the abundances are not precisely known, as much as 1,000 water molecule parts-per-million could be in the lunar soil. To put that into perspective, if you harvested one ton of the top layer of the Moon's surface, you could get as much as 32 ounces of water." For additional confirmation, scientists turned to the Epoxi mission while it was flying past the Moon in June 2009 on its way to a November 2010 encounter with comet Hartley 2. The spacecraft not only confirmed the VIMS and M3 findings, but also expanded on them. "With our extended spectral range and views over the north pole, we were able to explore the distribution of both water and hydroxyl as a function of temperature, latitude, composition, and time of day," said Jessica Sunshine of the University of Maryland. Sunshine is Epoxi's deputy principal investigator and a scientist on the M3 team. "Our analysis unequivocally confirms the presence of these molecules on the Moon's surface and reveals that the entire surface appears to be hydrated during at least some portion of the lunar day." The discovery of water molecules and hydroxyl on the Moon raises new questions about the origin of "Moon water" and its effect on lunar mineralogy. Answers to these questions will be studied and debated for years to come.